The Equipment Stands with either 1.5 inch back splash or 4 inch back splash are made specifically for use in the restaurant, catering and food service areas. 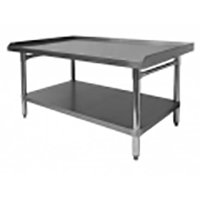 The standard work table is made of 430 stainless steel with galvanized legs and undershelf. All stainless steel work table is made of the best 304 Stainless Steel.